Marvel Strike Force (Free) is the kind of game that you would have assumed already existed. It’s a turn-based strategy RPG that has you gather five Marvel superheroes, villains, or in some cases, a mixture of both, and pit them against the teams of other players (asynchronously, alas) or waves of AI opponents from the movies and comics. 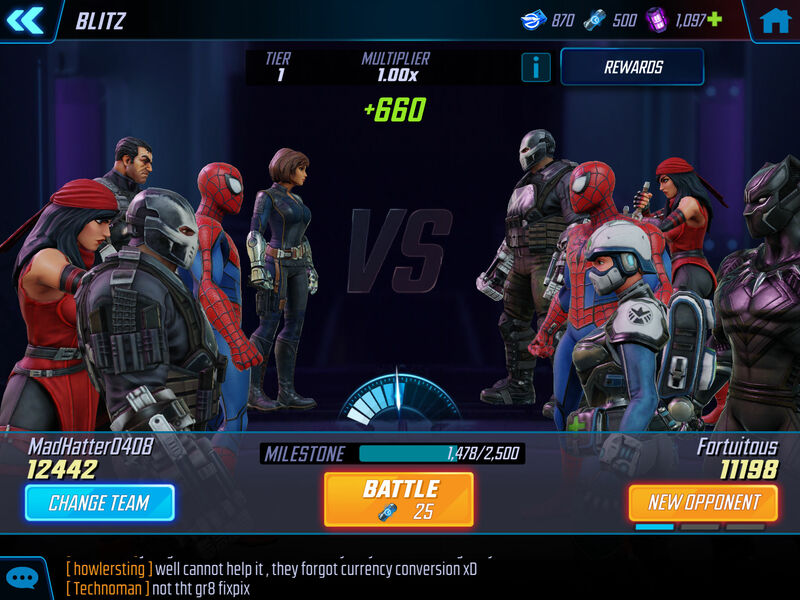 If comparisons are more your thing, it’s a lot like Star Wars: Galaxy of Heroes except with Marvel characters and by a different developer, FoxNext Games. Even if you’ve never played that game, chances are you’ve played something similar on mobile and Marvel Strike Force won’t be extremely difficult for you to grasp. That said, we want you to get the most bang for your buck, or even better, bang for no bucks. Read on and you’ll be exposed to all of our tips and cheats for playing as much as possible and unlocking heroes and villains without spending a dime — unless you want to, of course. 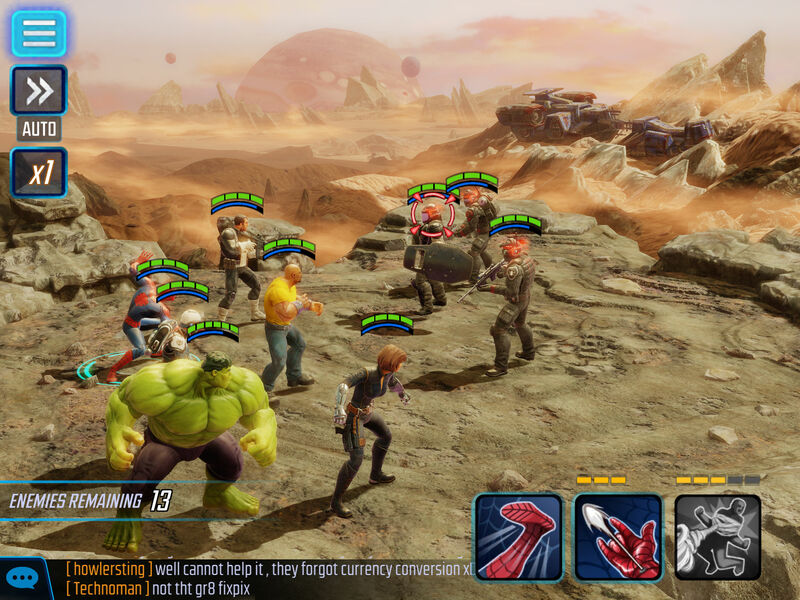 Marvel Strike Force uses a turn-based system where the order of actions in combat is determined by the characters’ speed. Each character on both sides of a fight has a blue bar under his or her health, and when it fills up, it’s their turn to act. When it’s one of your character’s turns, you’ll see a circle under them and icons for their possible actions in the bottom-right corner of the screen. Every character has one basic attack, which will be the first icon. The other icons represent additional attacks or abilities, which can include heals, buffs or debuffs, taunts which force enemies to attack them or multi-target attacks. Tapping and holding down on an icon will tell you exactly what that ability does. The small boxes above each ability signify whether or not it is ready to use, as all of them must be full before the ability can be activated. Think of these as another form of cooldown timer. A red crosshairs appears on your character’s current target, which you can switch to another enemy simply by tapping on them. Tap the ability to activate it and you’ll see the ability play out, usually with some pretty cool animation. That’s all there really is to it. Except for some specific scenarios where you must keep an NPC alive, activate a machine or survive for a specified number of turns, battles in Marvel Strike Force proceed until one side or the other is completely eliminated. The only other thing you need to know is that there are buttons in the upper-left corner that can speed up the action two or three times if you’re the impatient sort or automatically play the battle for you (that one looks like a fast-forward icon) if it’s an easy encounter that you are grinding out for some reason. One of the more common complaints about Marvel Strike Force during its release is that you quickly run out of Campaign Energy. That’s a fair gripe because every Campaign battle costs at least 6 units of Energy to play, so you can run out of it pretty quickly. Energy recharges slowly over time, and somewhat confusingly, there is a special currency called Campaign Energy Refill and the option of spending Power Cores, the game’s premium currency, to refill instantly. Nevertheless, there’s actually a lot more to do than just the Campaign mode, though other modes require you to level up before they all unlock. Here’s a brief overview of all of them in the game at launch. Campaigns – These are where the game’s story unfolds, with chapters requiring only heroes, only villains or a mix of the two. Campaigns cost Campaign Energy to play, can be replayed to farm specific rewards and can even be auto-played once you clear them with three stars — although Auto Win still costs you the same amount of Campaign Energy, so all it saves you is time. Challenges – This rotating set of daily battles can earn you specific loot like Gold (the game’s basic currency), Health Packs, Training Modules and more. Each Challenge can only be played three times in its 24-hour period, though they have multiple difficulty levels with better rewards as you move up. You can also choose to Auto Win a Challenge once you’ve cleared it with three stars. Arena – Here’s where you battle asynchronously against the teams of other players, using a mixed squad — so in other words, your best five characters, hero or villain. You have to set a squad for defense as well (which can be exactly the same one), and then you pick from one of three possible opponents when you want to battle. If you win a fight, you move up to your opponent’s rank, whereas you remain in your current rank if you lose. As long as you’re active in Arena mode, you’ll get a reward sent to your Inbox every 24 hours based on your current rank. Part of this reward is Arena Credits, which can be spent in a store specific to this mode. You get only five Arena attempts per day. Events – Not to be overlooked, these character-focused quest lines have you battle through an increasingly more challenging string of fights in order to unlock the hero or villain at their center, or to bump them to a higher tier if you already have them. Some Events don’t even let you start them until your profile is level 20 or above, so they aren’t necessarily fare for beginners. Blitz – Kind of a secondary PvP mode, this is where you can fight teams created by other players in ladder-like fashion. For every victory, you’ll earn points toward milestones that grant you ever better rewards. Confusingly, Blitz also has its own currency/energy called Blitz Charges, which you need to spend in order to keep using the same characters over again. Conversely, you can swap other characters into your team, so in time, this can be a useful mode for using heroes and villains who aren’t your mains. Alliance Raids – A special mode available only to players who have joined an Alliance, Raids are co-operative quests that require players to work together to take down extremely powerful groups of foes. Like Blitz, Raids have milestones which give out periodic rewards. They also have their own store with a specific currency, because why not at this point? Now that you know how to play and what you’ll be playing, it’s time to get down to the nitty gritty. 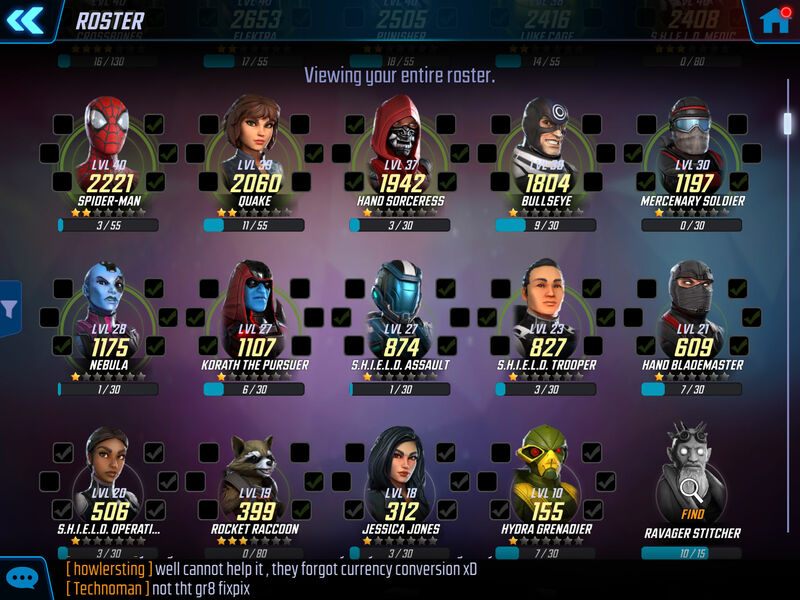 Specifically, you’ll want to be able to take advantage of all of the cool characters in Marvel Strike Force by adding as many as possible to your collection, and preferably without shelling out money for Power Cores. Like many games of its genre, this one uses a system of shards to unlock and tier up characters. What that means is that you’ll often find a shard or several shards as a reward, but rarely will you acquire enough of them in one go to add a new hero or villain to your roster instantly. Essentially, then, what you need to know is where and how to get shards, and we can help with that. 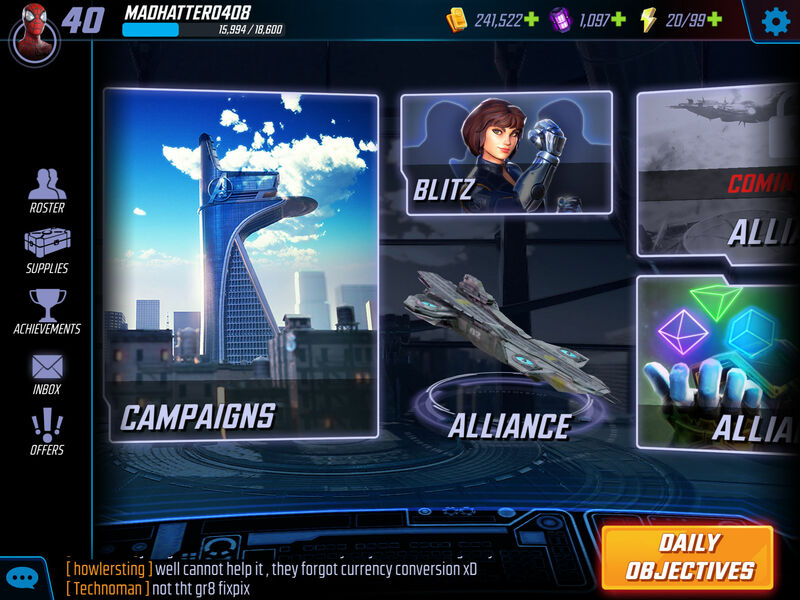 Log in and play every day – Not only does Marvel Strike Force have a login calendar that gives you stuff, including character shards every few days, just for logging in, it also has daily objectives you can find via the big bright button that says exactly that in the bottom-right corner of the main screen. If you do nothing else each day you play, be sure to clear out the daily objectives. They’re worth it in their own right, but clearing the daily objectives a number of times can unlock a new character for free. For example, at launch you could unlock Wolverine by clearing the daily objectives seven times. Use Auto Win on Campaign battles – Every third stage of each Campaign chapter offers character shards as a possible reward for beating it. Clearing it with three stars allows you to use Auto Win, which is a great way to grind out shards for a specific character. It also encourages you to keep advancing through the Campaigns as that will open up more shards you can farm in this fashion. Check for Events – As we’ve already noted, Events are where you can unlock specific characters just by playing through a series of battles. Every time you hit a level with a multiple of 10, you should revisit active Events as you may now be powerful enough to tackle a previously locked battle and earn even more shards. Play Arena battles daily – Arena wins don’t get you any shards on their own, but the Arena store does have a selection of shards for sale that changes daily. If you stay active, you’ll receive Arena Credits every 24 hours and be able to spend them on shards you want when they rotate through the store. Play Blitz mode too – You’re probably sensing a pattern here that almost every game mode is the path to shards, and you’re right. The Blitz milestones also grant shards at certain levels, though you’ll typically need to reach at least the sixth milestone to start getting them, which takes some doing. That said, once you’ve got a pretty powerful roster, Blitz should absolutely be part of your daily playing rotation. On top of that, the Blitz store is pretty similar to the Arena store except with its own currency and daily shard selection. One important note that may help you chase shards more wisely: If you tap on any character’s shards you want to purchase, it will tell you how many shards you still need before you unlock or tier up that character. it’s a very helpful way to prioritize. While it’s tempting to just toss your five favorite Marvel characters together in a group, that might not be the best way to proceed as you’ll likely struggle in fights where you don’t simply overpower your opponents (though to be sure, there are plenty of those). What you’ll want to do instead is get a team that actually has five characters whose abilities complement each other. Blaster – Whether they get the job done with guns like the Punisher or repulsor rays like Iron Man, Blasters deal high damage to one or multiple targets but are also the “squishiest" class, needing either heals or taunts or both to make sure they stay alive. Brawler – Arguably the most well-rounded and versatile class, they don’t do as much damage as Blasters but are also hardier. As the name suggests, they also deal their damage up close and personal. Controller – The toughest class to pigeonhole, Controllers have abilities that make life harder for enemies, either slowing them, debuffing them or causing other non-beneficial effects. A little squishy but not as bad as Blasters. Protector – Can force the enemy to attack them with Taunts, usually in conjunction with other abilities that allow them to stay alive when they are being targeted. Do the least damage with basic attacks but sometimes have surprisingly damaging secondary abilities. Support – Can be thought of as the healer class, with abilities that heal, remove debuffs and other good stuff. Can a team with one of each class work? It sure can, though that might leave you a little short on direct damage. A good idea when starting out is to have two Brawlers, one Blaster, one Protector and then either a Controller or Support character. Other combinations can also be very effective if you dive into character abilities more closely and see if there are synergies between them you can use to your advantage. Finally, you’ll notice every character in Marvel Strike Force has multiple traits — words that define them besides their class. For example, Crossbones has the following traits: Villain, Global, Tech, Protector, Hydra and Inhuman (which he’s not, so … I dunno). Traits can also help suggest groups of characters that will be effective together based on their specific abilities. Sticking with our buddy Crossbones, his Vengeance ability gives +5 Armor to anyone on his team with the Hydra trait. This is the top level of team-building, but one you’ll want to explore in more detail once you’ve been playing for a bit.